Improving On A Classic Idea. You want proof that a great idea never goes out of style? 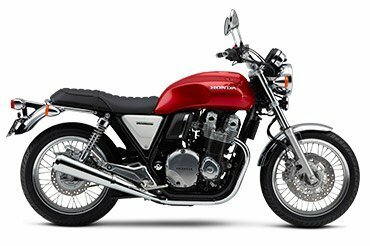 Then just check out the new 2017 Honda CB1100 EX. 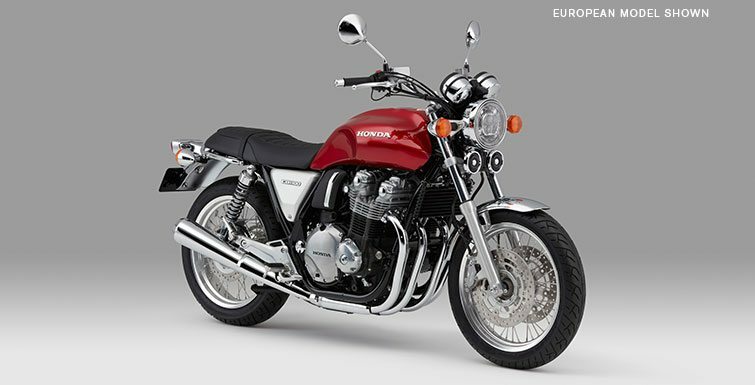 Externally, it’s pure Honda classic: that red steel tank, the air-cooled transverse-four engine, the brushed aluminum sidecovers, the round headlight, the chromed fenders, the comfortable, upright seating and tubular-steel handlebar. 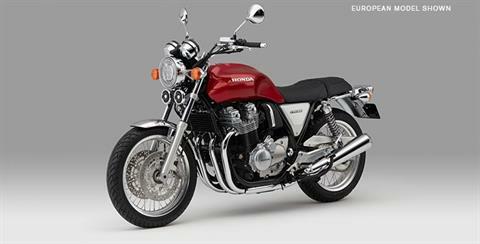 But twist the throttle, and you’ll see there’s nothing retro about the CB1100 EX’s performance. Displacing a full 1140cc, the six-speed overdrive gearbox and electronic fuel injection deliver performance no 1970’s classic ever could. But check out some of the details we’ve given this new machine: 18-inch wire wheels front and rear, laced with stainless-steel spokes. That fuel tank we talked about? There’s no bottom seam, so it has a super-clean, hand-built look. 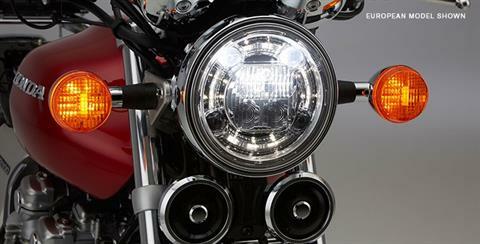 The headlight is a powerful LED unit, and there’s a new slipper-type clutch underneath that right engine cover. 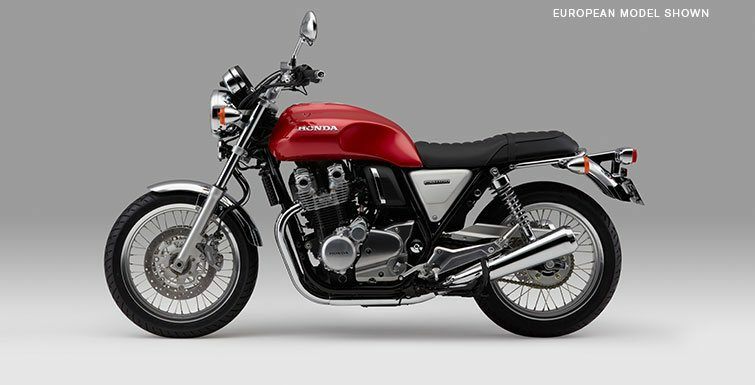 Perfect for just about anything you’ll ask a bike to do, the CB1100 EX takes a great idea and improves on it—Honda style. WIRE SPOKED WHEELS: Classic spoked wheels look great, but the CB1100 EX rolls on hoops with 40 stainless-steel spokes per wheel and aluminum hubs. Light and strong, they perform as good as they look. 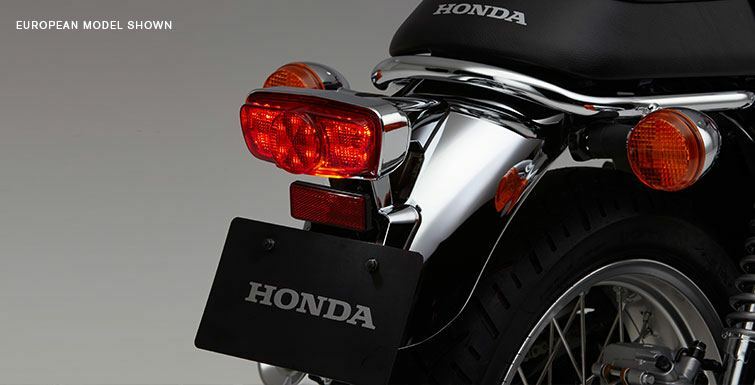 TWO-CHANNEL: ANTI-LOCK BRAKING SYSTEM: Honda’s ABS system, standard on the CB1100 EX model, provides additional confidence when stopping in less-than ideal conditions. 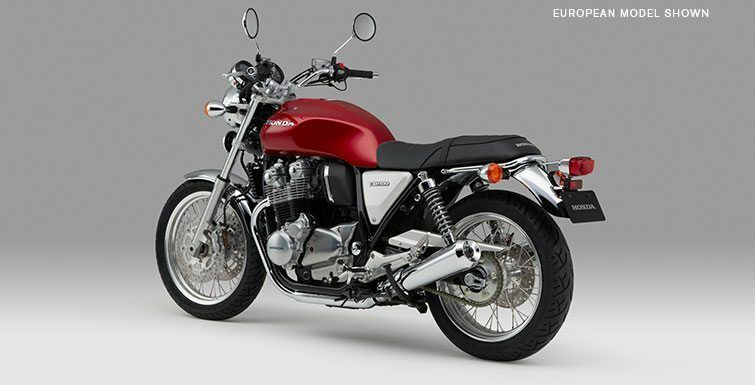 TWIN-SHOCK REAR SUSPENSION: Easy to adjust and equipped with preload adjustability, the CB1100 EX’s new Showa suspension offers improved compliance and proves that the traditional design, done right, can provide excellent handling characteristics. STEEL SWINGARM: Combined with the CB1100 EX’s steel-tube full-cradle twin-loop frame, the stout steel swingarm is part of the bike’s excellent handling package. COMFORTABLE RIDING POSITION: Honda’s classic inline-fours were very comfortable, and it’s the same for the new CB1100 EX. Ride it for 10 minutes or two hours and you’ll see that it’s one of the easiest-to-live-with machines in any class. STEEL CHASSIS: An air-cooled inline four engine in a classic like the CB1100 EX just has to bolt up in a twin-loop full-cradle steel chassis. The twin shock mounts complete the look. But this isn't some retro frame: Honda's chassis engineers have graced it with modern materials and construction techniques. The result is a bike that both looks great and handles like a modern bike should. PROGRAMMED FUEL INJECTION (PGM-FI): Improved cold-weather startups, no-drama high-altitude riding and no choke are just three benefits of PGM-FI. LARGE SEAMLESS FUEL TANK: The CB1100 EX features a fuel tank with 4.4 gallons of capacity. 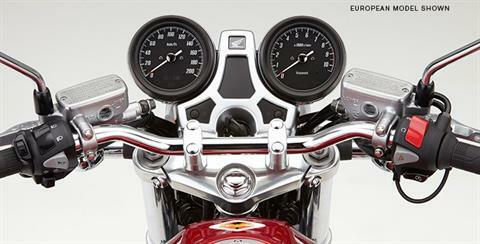 That, plus the bike’s excellent fuel efficiency, give you plenty of range. BLACKED-OUT ENGINE WITH ALUMINUM HIGHLIGHTS: Subtly blacked-out, the engine wears natural aluminum engine covers, and features a cylinder head finished in silver with a burnished aluminum cam cover and chrome end caps. 1140cc AIR-COOLED ENGINE: With an engine this size, you get power everywhere—enough to go on a spirited street ride, an hour-long cruise or carry a passenger with ease. FOUR-INTO-TWO EXHAUST: The CB1100 EX’s four-into-two exhaust pipe gives this bike a classic look along with a crisp sound, and the chrome finish is a great highlight, too. 41mm FRONT FORK: The CB1100 EX is equipped with a Showa Dual Bending Valve (SDBV) 41mm front fork, which uses two valves to generate both compression and rebound damping force for a linear suspension feel and excellent control. TIMELESS INSTRUMENTATION: New digital instruments tuck into classic round chromed instrument housings—the best for both worlds. You get proper looks and all the electronic functions you expect from a modern bike. TRIPLE DISC BRAKES: Nothing retro here: the CB1100 EX’s huge twin front discs and single rear disc are drilled for lighter weight and less heat retention, and offer smooth, predictable, powerful stopping capability. Naturally, the system features ABS as standard equipment.